Commander of the Islamic Revolution Guards Corps Navy Rear Admiral Ali Fadavi (photo) declared that the IRGC has built modern speedboats cruising at 80 knots, Fars News Agency (FNA) reported. “We have mass produced these speedboats and we are looking forward to increasing their speed according to our time-table,” Admiral Fadavi told reporters on Sunday. In relevant remarks earlier in March, Admiral Fadavi had said that the IRGC is the only navy in the world that could design and manufacture this type of boats cruising at 80 knots (148 kilometers) per hour. Earlier this year, Fadavi had said that anti-ship cruise missiles and cannons were previously not available on speedboats, but the IRGC experts managed to mount them on the vessels. He added that the military vessels, capable of cruising at the speed of up to 120 knots (222 kilometers) an hour, could now be designed and tested at the IRGC naval research laboratory. In the past, he said, Iran had to carry out such tests abroad. 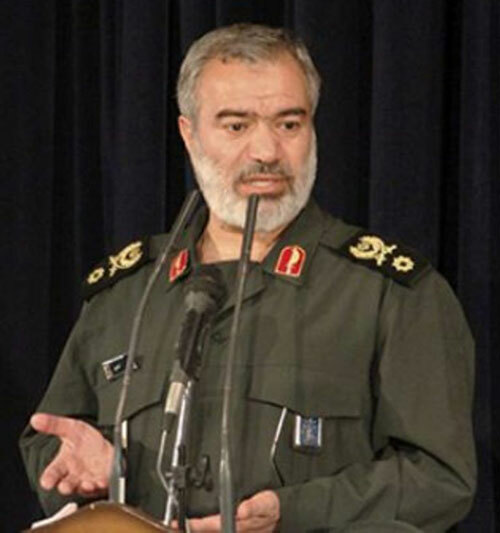 The IRGC Commander said the Navy plans to mass produce, within the next few months, speedboats that travel at a speed of 80 knots (148 kilometers) per hour, and are armed with missiles capable of striking targets at 100 kilometers (62 miles). Last year, the IRGC equipped its speedboats with domestically designed and manufactured Ghader (Capable) anti-ship cruise missiles. Iran unveiled the home-made Ghader missile back in September 2011.